Here at Cuts & Colours, we specialise in offering a real unique colouring service. If you are after new, beautiful hair colour you need the colour experts! 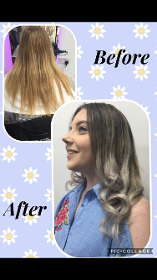 Whether you want a head full of highlights or to touch up your roots we will fulfill your colour dreams.With respect for your natural hair colour, texture and condition, we offer a huge variety of colour treatments personalised to suit your hair and budget. We offer hairdressing , barbering and beauty treatments. I went there for a quick trim but I managed to get a lot more than a trim and was very happy with haircut and the finishing.